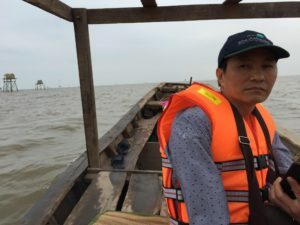 Tao Van Dang has served as the activity manager for the Participatory Coastal Spatial Planning and Mangrove Governance project in Vietnam since 2015. With more than 20 years of project management experience, particularly in non-governmental organizations, Dang has overseen mangrove re-forestation and disaster preparedness projects throughout Vietnam. I led a team to implement the “Our Coast – Our Future” activity under USAID’s Tenure and Global Climate Change program, which piloted a Participatory Coastal Spatial Planning process (PCSP), including a low-cost participatory spatial mapping for mangrove governance in three coastal communes of the Tien Lang district in Hai Phong municipality in Vietnam from October 2016 to December 2017. Starting with stakeholder engagement, we introduced the project’s participatory mapping process to a range of stakeholders from local government, political and social organizations and coastal resource use groups. This first step in the process was to share the pilot’s objectives, processes, the current state of mangroves in the area and the planned benefits. From this step, more than 150 people were selected to continue the work on a Participatory Coastal Resource Assessment (PCRA) within the three coastal communes of Vinh Quang, Dong Hung and Tien Hung. The Participatory Coastal Resource Assessments were used to develop coastal profiles on current uses, management of coastal resources and tenure. Next, results of the Participatory Coastal Resource Assessments were combined with the instruction and creation of spatial maps to provide a clear picture of coastal resources uses and governance on the ground. Through the Participatory Coastal Resource Assessments and mapping activities, we worked with commune members on identifying development goals and determine future coastal resource use, including how strategically placed mangrove plantations can help protect livelihoods and coastlines. Finally, we supported Tien Lang district to finalize their coastal spatial planning report and mangrove co-management report. These reports were shared widely with ministerial agencies and 25 coastal provinces of Vietnam. Thanks to great local-community participation, our team produced a toolkit, which included three guides for Participatory Coastal Spatial Planning, two gender briefs and one lessons learned brief to guide future projects. In Vietnam, mangroves have experienced consistent deforestation pressures since the 1980s because of agriculture development, aquaculture farming and other infrastructure development. However, it is increasingly clear that mangrove forests hold considerable importance within Vietnam’s coastlines because they provide a buffer against intensifying coastal disasters such as typhoons and adapt to rising sea levels. They also provide important sources of livelihoods, including aquaculture, coastal gleaning and fisheries, as well as biodiversity conservation. The negative impacts of mangrove loss such as broken dyke sites, saltwater intrusion and farming failure become clear several years after mangrove deforestation. Therefore, mangrove replanting and conservation has been carried out since the 1980s, but to varying degrees of success. USAID’s “Our Coast – Our Future” pilot project is different because it promotes the design of coastal spatial scenarios to inform participatory, tenure-responsive approaches to coastal spatial planning. The pilot identified ways to improve the management of specific coastal natural resources by examining who has access, use, management and exclusion rights to specific resource areas of the coastal landscape. What are key achievements/successes from Tenure and Global Climate Change’s work in Vietnam? In Vietnam, the Tenure and Global Climate Change project developed many realistic best practices, including a toolkit, a refined process on strengthening tenure in coastal communities and a lessons learned report describing pitfalls to the pilot’s work in land tenure. These outputs will be used by the World Bank’s Forest Sector Modernization and Coastal Resilience Enhancement project in nine coastal provinces of Vietnam, scheduled from 2018 to 2022. During the stakeholder engagement step, it became clear to our team how “support from key leaders facilitates broader engagement.” This was essential to the project’s success. The Participatory Coastal Spatial Planning process requires substantial and wide-ranging stakeholder engagement, from the provincial to the village level. It showed us how essential it is to have the right representatives involved at each level to ensure participation and eventually, the acceptance of project results at the activity’s completion. Another important lesson learned is how “community participation in mapping and coastal profile development yields robust plans.” The pilot project took steps to ensure that men and women from all coastal-area resource user groups participated at the commune-level workshops and activities. This was achieved by careful facilitation of event location and timing, as well as discussion content, to meet the needs of all the groups the project sought to engage. The project also noted how “gender-targeted engagement leads to inclusive planning” as participatory spatial planning requires engagement from all social groups. Women and men access, use and manage coastal natural resources differently, and therefore, there was not, nor could there be, a one-size-fits-all approach. Project information and documents on Tenure and Global Climate Change‘s work in Vietnam can be found on the LandLinks project page, here.